The structure of the texts on your site is important for SEO. If your content is clearly structured, your chance to rank well in Google will be higher. In this blog post, I’ll tell you why text structure is so important. How do people scan a text? Before deciding whether or not to read something, people tend to scan a text. They want to know what your text is about, before starting to read it all the way through. There are some parts that people look at or read specifically when scanning a text. Headings and subheadings are really important, as is the first paragraph of a text. But also the first sentences of every new paragraph catch the eye of scanners. How does Google “scan” a text? Google defined, in some of its patents, ranking signals such as semantic closeness. Semantic closeness refers to the proximity of related words in a text, while taking into account the formatting of that text. To be able to understand semantic closeness of words, your text’s structure must be clear. In another Google patent, “the reasonable surfer” Google explicitly talks about headings. Headings containing certain keywords are important for the topic of a given page. With the Hummingbird update, Google became a lot better at recognizing synonyms. There are more patents that hint at using a text’s structure to understand the text. Google, over time, has become much better at analyzing content. The better you write, the easier it becomes for Google to understand your content and therefore to rank it. Setting up articles with clear structure has a positive effect on the ranking for another reason as well. Well-structured texts have lower bounce rates and higher chances to receive social media attention. This, in itself, leads to higher rankings. If you want to improve the structure of your text, you need to pay attention to: 1. the first paragraph of your text; 2. your headings and 3. the first sentences of every new paragraph. Some time ago, I wrote an article on how to set up the structure of a blog post. Make sure to read that article if you have trouble setting up the structure for a text. You should clearly formulate what your post is about in the first paragraph. In printed texts, a writer usually starts off with some kind of teaser, but there is no time for that if you are writing for the web. You only have seconds to draw you reader’s attention. Make sure the first paragraph tells the main message of your post. That way, you make it easy for your reader to figure out what your post is about and: you tell Google what your post is about. Don’t forget to put your focus keyword in that first paragraph! Another reason to have the focus keyword in your first paragraph is simple psychology. People recognize the word they sought for and think they’re in the right spot! Headings should be attractive and should clearly state the content of the paragraph below it. Headings allow your readers to quickly scan through your text and to decide whether or not they would like to read your article (or which parts). We would advise you to put a header above every long paragraph (or above a group of paragraphs which are thematically similar). In our Yoast SEO plugin we check whether you use your focus keyword in your headings. It’s helpful to search engines if a heading defines what a piece of text is going to be about. Whether they’re a ranking factor or not (and SEOs do quarrel about that), headings are of great importance to the structure of your text. Google will therefore probably use them to determine what the text is about. Make sure the first sentence of a paragraph is the most important, the core sentence, of that paragraph. After all, people tend to read the first sentence of every new paragraph as they’re scanning through content. The other sentences in a paragraph elaborate upon that first core sentence. Chances are Google will pay extra attention to these sentences, in order to determine the topic of a text. They are great places to use your keyword, if possible. If you’re writing a well-structured article and staying on-topic, your keyword will come up naturally in many core sentences. Text structure is important to attract readers to your blog, as well as for SEO reasons. Writing well-structured and well-written texts isn’t easy, though. At Yoast, we are strong believers in the importance of quality content. Currently, we’re thinking about ways to help our clients write quality content. That’s why we’ve hired our very own linguist, Irene. 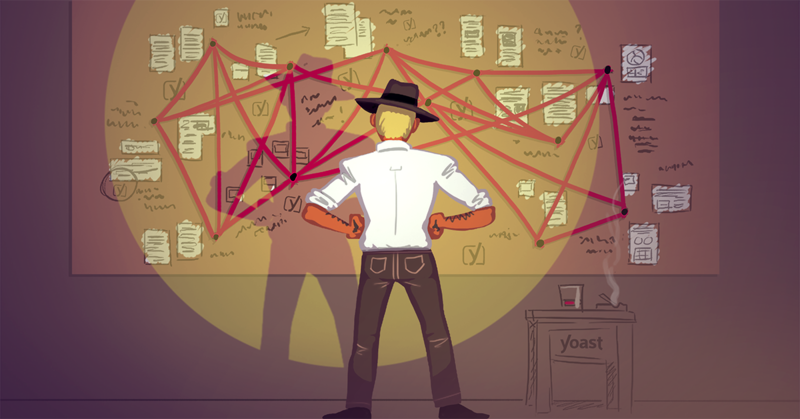 Irene is investigating on how to improve the content analysis of Yoast SEO. She is developing checks which will help our customers to make their blog posts more readable. We’re also setting up an SEO copywriting course together, in which we learn people to write quality content.